Employees are the best defenders of a corporate reputation, but many companies do little to cultivate and motivate these potential brand ambassadors, said Leslie Gaines-Ross, chief reputation strategist at Weber Shandwick. Executives from LinkedIn, Zappos, Dell and Dynamic Signal served as fellow panelists. The survey found that nearly six in ten (56 percent) of respondents have either defended their company to friends/family member or publicly via blog, website or newspaper. That figure of “first responders” rose to 59 percent during a top-tier change event such as merger/acquisition, downsizing, crisis or disaster. Employee engagement, however, is falling short. Only 42 percent of workers’ “know enough to explain to others what my employer does,” according to the survey. Only about four in ten (37 percent) understand their company’s goals. Gaines-Ross talked about the “big bang” impact of social media on staff activism. WS believes the next frontier for organizational change is how executives use digital communications and modeling internally. 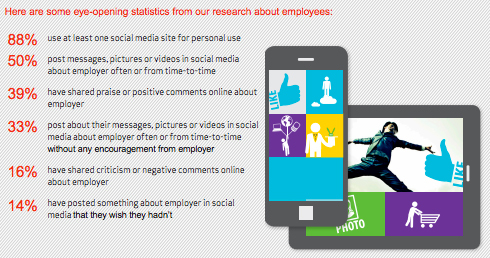 The research found that half of employees post messages, pictures or videos in social media about an employer either often or from time-to-time. Nearly four in ten (39 percent) have shared praise or positive comments online about their employer, while a third use social media for messages about an employer without any encouragement. Gaines-Ross noted the lines between work and personal lives barely exist. It’s up to companies to embrace that reality to understand what drives workers to become positive activists. She reviewed the six segments of the workforce activism spectrum. Forty-seven percent of workers are defined as either ProActivists (highly social workers with positive actions) or “PreActivists” (mostly positive actions with some negative activity). Twenty-two percent are “InActives,” showing little motivation to do a good job, 13 percent are “Detractors,” 11 percent are “ReActivists,” exhibiting an average level of engagement, and seven percent are “HyperActives,” having the most potential to help or damage a corporate reputation. The WS playbook calls for customized strategies and tactics aimed at each section of the activism spectrum. The goal is to identify a “band of employees” who will spread the right corporate messages and recruit others to defend a company during a crisis or when ncreased outside scrutiny.